Google has a lot of services for mac and one of them is quite helpful for people who use Gmail as their mail service, and also for business people using Google calender to save and browse the events for future. Its Google notifier for mac which helps in getting you notified about any new mail or event that is close to the present time. You get notified whenever a new mail enters reaches to you, and there are some settings like enabling the popup for mail notification, sound for notifying etc. You can also choose from one of the services to check and compose mails for your gmail account. You can make the gmail button on the top of the mac panel to instantly check for any new mail, or can compose a mail from the Mail app in your mac. It is an easy access to your new Gmail messages with a quick preview of the message subject, sender, and snippet. Preferences have some options for you to make things easier for you, like composing mail from the gmail in browser rather than the mail app, and also changing the beep sound for mail notification, and the time settings for calender events notification. 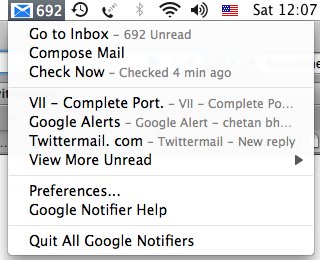 You can download the Google notifier for mac from here. Gmail Notifier is very usefull and easy to use !! !